Traffic intersections and all applicable laws are necessities to ensure that our nation’s roads function smoothly. Without some sort of organization, you’d be risking your life every time you needed to drive from point A to point B. Even when intersections are controlled by signs and traffic lights, they can be dangerous when combined with a negligent driver. San Diego is full of some of California’s biggest intersections, which unfortunately lead to some of the biggest accidents. San Diego drivers who do not follow traffic laws increase the risk of injury or death for bicyclists, pedestrians, and their fellow motorists. Failing to obey traffic laws is considered negligence and negligent drivers are liable for any accidents they may cause. 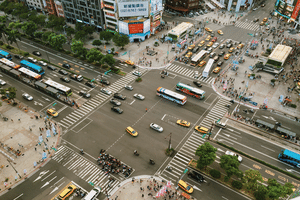 If you are a pedestrian, bicyclist, motorcyclist, passenger, or driver who is injured at an intersection due to a negligent driver, you may be eligible for compensation. To determine whether you have a valid personal injury claim, contact an experienced San Diego car accident lawyer at the Jorgensen Law in San Diego at 1-888-855-2948 or fill out our online form. We have representatives available 24/7 to schedule your free case evaluation where you can discuss the best course of action for your unique circumstances. What Causes Collisions at Intersections? Driving under the influence of alcohol or drugs – Impaired driving causes many preventable collisions. Drugged or drunk drivers cannot react quickly due to impaired motor function. This leaves them more susceptible to poor safety decisions and more likely to run a traffic light. Fatigued driving – Studies show that tired drivers are just as dangerous as drunk drivers. Like their impaired brethren, fatigued drivers have slower reaction times making them dangerous at bustling intersections. Distracted driving – When a driver isn’t paying attention to the road, they become a danger to others. Motorists who devote their attention to other things often fail to notice stopped vehicles or traffic signals. Speeding drivers – Many drivers speed up at an intersection to beat the red light, leading to more than a few traffic accidents. Unsafe speeds make it difficult to react to the actions of other drivers. Defective vehicle parts – Auto part defects like faulty tires or defective brakes can contribute to intersection accidents by preventing motorists from stopping in time at a stop sign or red light. Poor intersection design – Intersections that provide partial visibility or don’t clearly mark traffic lanes can lead to collisions at intersections. Why Should You Hire a San Diego Personal Injury Attorney? Traffic intersections in California do not use imaging equipment when someone speeds or runs a red light. The only equipment allowed is that which is hand-held by an officer or installed in a law enforcement agency facility or vehicle. This may make it more difficult to prove liability in an accident. An experienced San Diego car crash attorney can help you prove your case and obtain compensation for your injuries. As the victim of a motor vehicle accident, you may be facing substantial financial, emotional, and physical challenges. Our personal injury attorneys will fight aggressively to protect your rights and recover money to pay for lost wages, medical bills, physical therapy, pain and suffering, and future medical care. Call the Jorgensen Law in San Diego at 1-888-855-2948 or fill out our online form 24/7 to schedule a free initial consultation. We won’t charge a fee for our services unless you win your case.